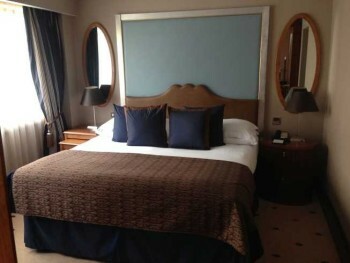 By a coincidence, we (Rob and Anika) each stayed at one of the two London InterContinental hotels over the last ten days. We thought it would be interesting to do a ‘compare and contrast’. 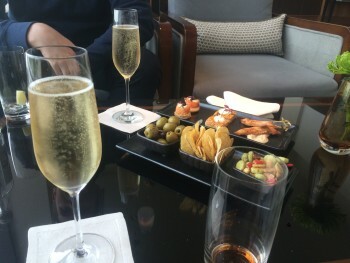 Today, Anika reviews the flagship InterContinental London Park Lane and tomorrow Rob will look at the brand new InterContinental London O2. 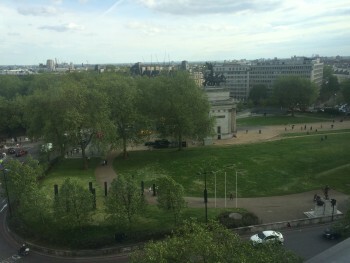 IHG invited Head for Points to their annual partner day which included a free stay at the InterContinental Park Lane. Whilst I live in London, it seemed a shame to waste the room and I thought I might as well stay over and write up a brief review. 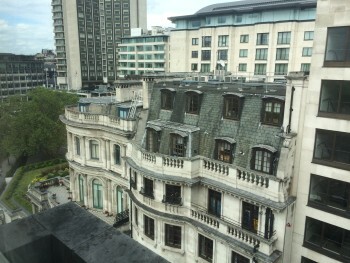 Park Lane is, theoretically, one of the global flagship properties for InterContinental. The hotel reopened in 2006 after a huge refurbishment costing a reported £75m. The location of the InterContinental Park Lane is great. Right inbetween Green Park and Hyde Park and two minutes from Hyde Park Corner tube station you got everything you need on your door step. 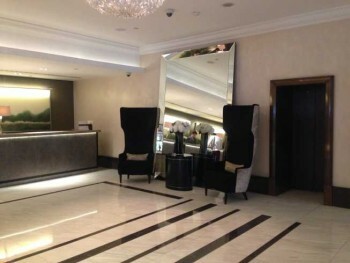 Marble Arch is about a 10 minute walk and Piccadilly Circus is also in walking distance. Living in London and knowing the traffic I find it important to be able to walk to places rather than taking a bus or taxi. The reception area is light and spacious with sitting areas. There are enough desks that even during busier times you shouldn’t have to wait too long to be checked in. 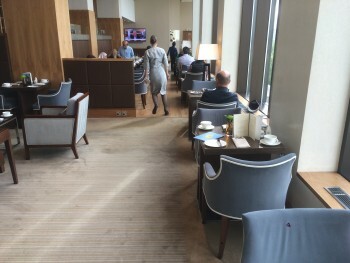 Unlike many modern hotels, Park Lane does have a fair amount of ‘people watching’ space. The two restaurants, open plan bar and afternoon tea areas are all on the ground floor. My room was a Studio Suite with separate living and bedroom. This is not the room you would get if you book a basic room. Unfortunately, because this was not an official review trip, I wasn’t able to get a tour of the other room categories. The bed was nice and comfy. 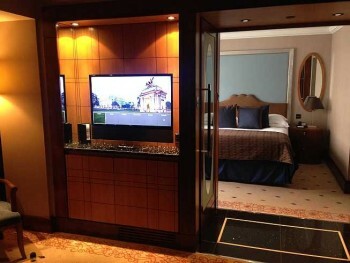 In the bedroom you could also find a BOSE radio with iPod / iPhone dock. It is not compatible with the newer iPods and iPhones and should be updated – this is a hotel which sells for £400+ a night for a basic room on its busiest nights. with sofa, chairs and another TV. The bathroom was a bit small but had a shower / bathtub and enough space around the sink. As you can see the toiletries were the standard InterContinental Agraria brand, though they were bigger 100ml sizes than in some other InterContinental rooms I’ve stayed in the past. 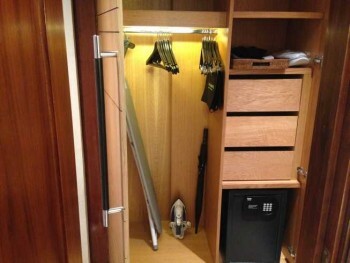 There was a safe and ironing board in the wardrobe. All in all it was a great room with lots of space. 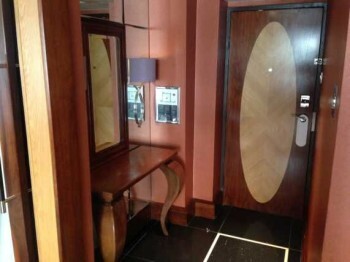 However the style seems a bit dated as you can clearly see from the pictures – I can only imagine that this room must have looked dated on the day the hotel reopened back in 2006. 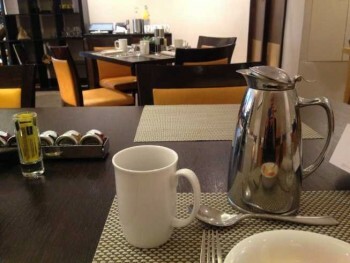 The lack of a coffee machine (or kettle – unless I missed it) is also an issue as most hotels provide at least a kettle for every room. An in-room Nespresso machine is pretty standard in even basic rooms at modern luxury hotels, let alone a suite. Breakfast is being served in the Cookbook Cafe with the option of a cold continental buffet, added hot food or a la carte. The public areas are, I think, much more successful in terms of decoration. They felt fresh and modern, which just made me even more confused about the choices they had made for the rooms. The Arch Bar on the ground floor is a good place to start or, in my case, end an evening. Because I was busy with IHG events throughout my stay, I didn’t get a chance to visit the gym (which I believe is very good) or spa or eat in the well regarded Theo Randall Italian restaurant. On the 7th floor is the Club Lounge. This is probably the most successful part of the hotel and may be the main reason to stay at the InterContinental Park Lane. I popped in during breakfast and the spread looked very impressive. There were also ‘cooked to order’ dishes available. There are worse ways to start your evening in London. The only surprise was the lack of any lunch in the lounge. At noon there was nothing available except some cookies, crisps and soft drinks. There is a pause between breakfast, which I think ends at 11.30, and the afternoon snacks which start around 3pm. This is a tough one because I never got to see a standard room. I liked my Studio Suite but it didn’t feel like a modern luxury hotel room. As it wasn’t huge, I imagine the standard rooms are relatively modest. Any that overlook the central courtyard will be even more underwhelming. On the other hand, if you are booking a Club room, or are willing to pay a supplement per night per room to get access, I think you will enjoy it here. The public areas are also very attractive and I believe that dinner at Theo Randall comes highly recommended. The location is obviously great, but there are plenty of other hotels on Park Lane. You can walk out of the InterContinental and be in the Four Seasons within 30 seconds. 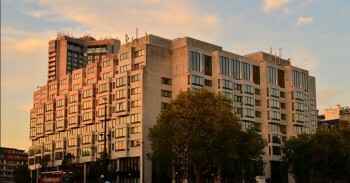 In some ways the Crowne Plaza Kensington or the Indigo Earls Court, which I also visited as part of the IHG partner day, have more to offer in terms of style and value for money. 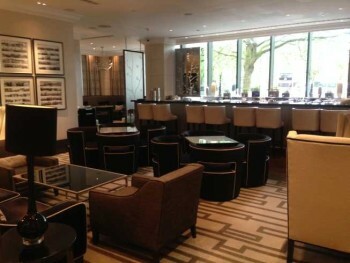 You can find out more on the InterContinental Park Lane website here. 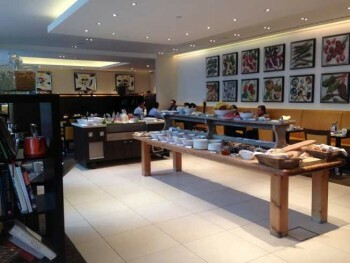 We stayed in January and I thought the hotel was very good compared to the Hilton park lane. The lounge was superb. I can’t remember what category room we had but it was upgraded 2 levels and whilst not large it was furnished to a higher quality than the room photos in the article. The gym wasn’t too bad fir a hotel. The service in the lounge was extremely good. We were doing a reward stay and IHG voucher with AMB status. Over the years I’ve received occasional upgrades to a suite. 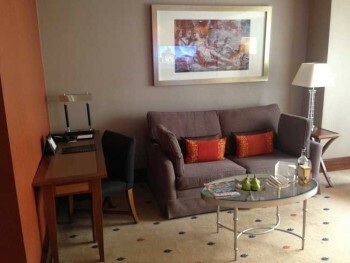 In a few instances the suites have had somewhat dated furnishings while the standard rooms have been more modern. Maybe the hotels think ‘people who like staying in a suite’ prefer those kind of furnishings, or maybe they see it as saving money on refurbishing whilst delighting guests with a free upgrade? Hi Rob, just wanted to thank you once again for your website. We’ve just checked into Intercontinental Century City in Los Angeles thanks to 50,000 IHG points collected via “accumulate” promo. The location is great, next to Beverly Hills and next door to 20th Century Fox studio and I am actually watching at the film set right now. We have also flown by BA First Class thanks to Amex cards/Avios. Have they finished the refurb yet? Also.. Take a left out of the hotel and walk a block, huge AMC cinema complex and shopping center! We had a a junior suite there back in February, lovely hotel, make sure you tip the car parking attendants a couple of bucks and they’ll stock your car with ice cold water!! Yes, refurbishment completed. Yes, AMC and Westfield are 10 mins walk. Loved this hotel! Looks like you had a one bedroom suite and not a studio suite as mentioned. The tea and coffee items are in the cupboards below the TV in the living room, next to the minibar. No its a studio suite, room x43. you can also request a nespresso machine which they will bring up along with pods. I stayed here a few months ago and found the room – which I was told was a two level upgrade from a standard room – to be very small, as was the bathroom, and the style is indeed very dated. Overall I thought the hotel was very overrated. I have stayed numerous times at the IC Kyiv which has larger rooms and a much better feel to it. Contrast the IC Park Lane to a stay last week in the AC Malaga Palacio, Spain, where my mere Silver Marriott status got me upgraded to a great very large corner suite with superb views. The valet parking and excellent service in the rooftop bar and restaurant were far more than I would have expected in a four star Marriott! Not one of the best ICs. Our so-called “two level upgrade” got us a shoebox overlooking Hamilton Place. £70 for a Club Access upgrade, but they don’t start serving until 5:30pm which barely fits in with many theatre start times. 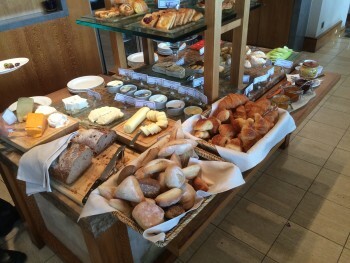 Good breakfast in the Club lounge. Overall, OK for a night stop voucher, but otherwise as Rob says there’s many better places to stay. Breakfast brought to your room: American – $24, Cont – $19, plus taxes. London superior,London,deluxe,London executive just to fool us in the upgrade system. This is the only property that will never grant Royal ambassadors complimentary club access,i ve visited recently top IC like Paris,Hong Kong,Beirut and got free club access. 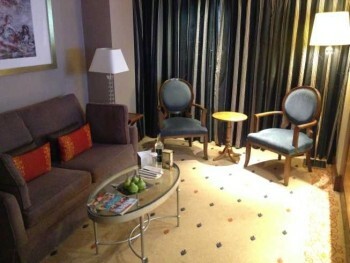 Your room is 1 bedroom suite the studio suite is an open plan with just a sofa and chair as seating area. just to mention it my sister necklace was stolen last april at this hotel,IHG reviews refused to publish my review but refered it to the hotel to deal with it as they are doing with each review with critical matters like expired food. all rooms have coffee equipment innthe cupboard. 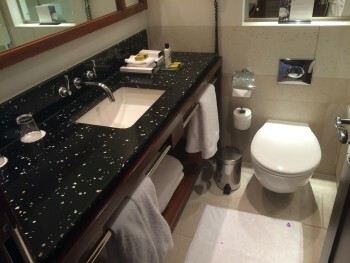 Totally agree with every word,i am Royal Spire elite and i have to pay for top room to get some decent upgrade. How much is the club access and what are the opening hours for evening drinks? £78 inc VAT for Ambassadors, perhaps a touch more for others. May not be offered if hotel busy. Canapés and Moët starts at 5.30, not sure when it ends. Staying here just now (very nice). I am Platinum Ambassador and we are on a free Accelerate night. We weren’t offered Club Intercontinental at check in. Might have taken it at £78, but registration form had a box to tick to agree to be charged £95 + VAT for this. However, not sure how come, but they had us down for being a party of 3 adults, when we are only 2 so that might be why club was more expensive. The receptionist then changed the allocated room and said it was a double upgrade (king deluxe). We have a sort of view through the trees, room was ready at 9.15am and we are not checking out till 3pm, all on a one night free stay, so can’t be beat! And Theo Randall was to die for! Roomtypes with London: are refurbished and updated, the others aren’t. I had a good stay at this hotel, it helps to mail beforehand to ask about any preferences.